Currently the standard carry issue for Federal Flight Deck Officers, the 31L F.F.D.O. 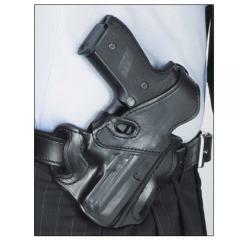 with Lock Hole Belt Holster from DeSantis delivers reliable daily sidearm carry and secure firearm storage in one sleek package. Designed to handle the extreme duress of regular tactical use, the holster is constructed from premium-grade leather for maximum durability. Its ergonomic shape wraps around the entire pistol, including the slide, for a secure hold that is guaranteed to keep weapons in place. The trigger cover features a reinforced slot for padlock integration, allowing operators to securely store firearms when not in use. The pancake-style mount utilizes three belt slots to offer both cross and strong side draws. The 31L is compatible with belts up to 1.75-inches.